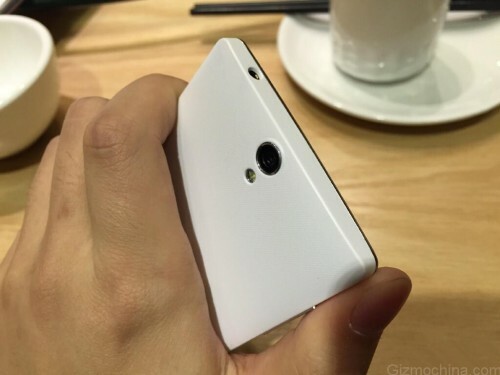 Is this our first look at the OnePlus One Mini? We do love the OnePlus One here at ShinyShiny (especially our Editor, Holly), and following some hubbub about the upcoming sequel phone something else has popped into the limelight: pictures of what is apparently a smaller version of the original OnePlus One. The images come courtesy of Gizmochina, alongside information that the phone will come with a 64-bit octa-core Snapdragon 615 processor, dual 8MP cameras, and running Android 4.4.4 (KitKat). As TechRadar points out this is much lower-end hardware than what came with the original OnePlus One. Calling it the OnePlus One Mini might be a bit redundant as well, because if the leak is accurate then it’s not actually that small. It’s got a 5-inch display, which is barely smaller than the 5.5-inch OnePlus One. Then again a difference of half an inch might be enough to sway people put off by the original’s size. None of these things are particularly bad though. The OnePlus One was celebrated for its relatively low price when compared to other flagships, and since Gizmochina claims the OnePlus One Mini will cost 1,499 RMB (£155) it definitely seems like the lesser hardware will be reflected in the price. We don’t know much more, but we’ll keep you updated if any new information pops up.